So - here I am again... I have, once again, managed to take a minimum of one photo per day! Some days there have been a glut of photos to choose from; some days there was only one picture that stood out! It is fun to decide though - and I LOVE the lack of limits I have given myself; as on one day I just couldn't decide and you have loads to look at, but the last three days there has only been one photo per day that has inspired and delighted me (despite the fact I took many more)! The only photos I took today - my baby girl is EATING once again! Yay! It was so exciting to see her show hunger, and really start to enjoy her food once more... by Thursday (12th) she was totally back to normal, and we are so grateful! This was the beginning of the end; whew! This morning Mr.C, who had just been outside for something, raced back in and called us to follow him - and there in the carport were these two HUGE boxes with our names on it! So very exciting - of course, we knew what they were but Button did not, and she was intrigued! 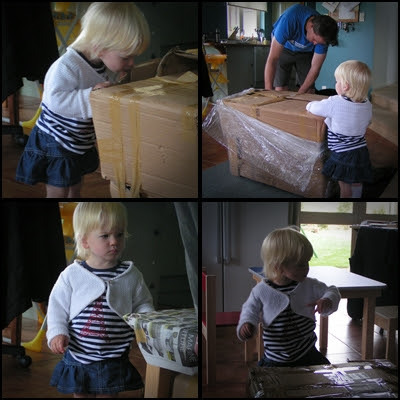 You can see her waiting to see in the first picture what it was... and then in the last photo (bottom right) she is pointing to the second package - as though to remind Daddy that there is more to open, so hurry up! 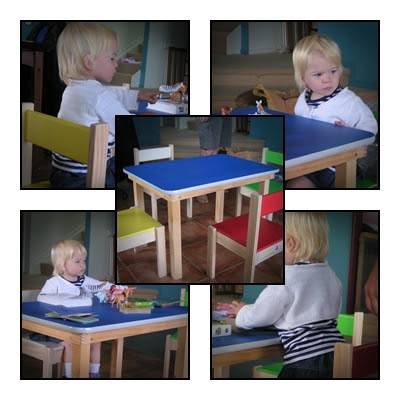 And here it is altogether... a gorgeous table and four chairs! 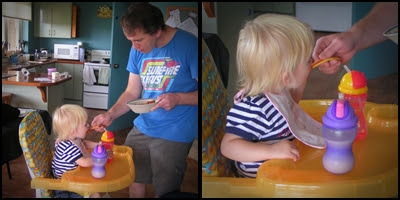 You can see in these photos that she had to take a turn sitting on all four chairs, and each time she dragged Daddy to sit down beside her as well - so cute! She LOVES it, and has spent time everyday at it so far ;-)! Yay! We're so glad we chose this for her - it'll last her and the next child(ren) for years to come!!!! 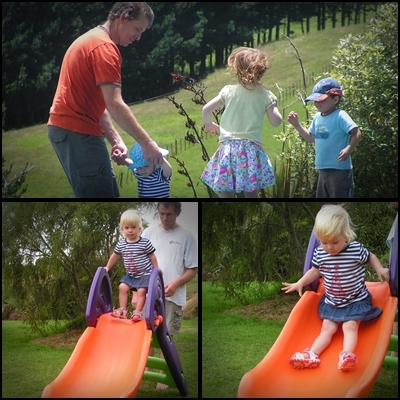 Then later that same day she wanted to go outside and play for the first time... not only did she have a lot of fun, but she also learnt how to climb up the slide and slide down by herself with no help! It was a GOOD day, despite not being back to herself completely; we could see the end of the sickness was finally near! Here is Button receiving her first bunch of flowers... from her Daddy! Button LOVES flowers, she stops and sniffs every flower she ever see's (real or not). Despite the fact these were just weeds (dandelions etc), and stunk - she spent a long time walking around sniffing them (and making us sniff them to *cringe*)! It was the CUTEST thing ever, her face was priceless :-)! Such a sweet thing for Daddy to do (he'd been out on a run)... I hope he continues to do these kind of sweet things for her as she gets older! Today was the first fully well day - no grizzles, no clinging; just our happy toddler back full-force (including hardly any day sleep... again)! That morning she went out grocery shopping with her Daddy and had a great time, and then we popped over to spend the day with Mr.C's sister and two girls, and we all had a lot of fun! It was so funny, as it is like Button suddenly understood the whole 'hug and kiss' thing... while she has always given us cuddles and kisses when asked, and will do so with other selected adults - kids got pushed aside! When her older cousin gave her a thank you hug for her Christmas present, it actually got reciprocated... and here they are kissing 'goodbye'! It's not the best photo, toddlers never stay still long enough (and it was posed for); but it is still priceless! When we got home, she then tried hugging to two neighbour boys, neither were especially keen though ;-)! Today was a 'Mummy Day', I got to go down to Hamilton to catch up with some really good friends... one was over from Australia, and one up from Nelson! It was the longest I have ever been away from Button (8am to 4pm); I was totally confident in Mr.C's ability to look after her for the day - but was a little worried about how she would handle it! I got home, and other than a quick hug - you'd have never known she even noticed I hadn't been there all day! Gives me confidence that when I go away for the weekend (some time before Baby 2 is born) that they'll both cope fine without me! It was a truly wonderful day - thank you Lee and Marianne! I absolutely LOVE the cousins kissing photo. It is just gorgeous. In black and white like that it would make a lovely gift on someone's wall...the movement and moment it captures is fantastic.